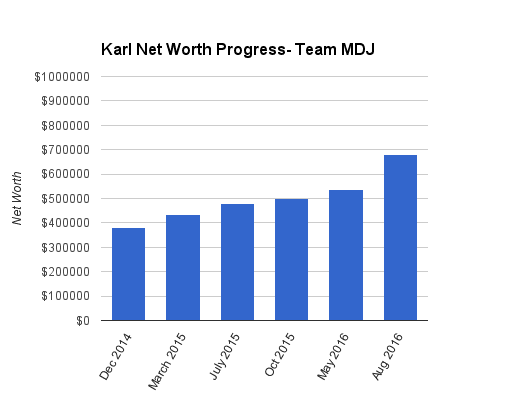 Welcome to the Million Dollar Journey August 2016 Net Worth Update – Team MDJ edition. A select group of readers were selected to be part of Team MDJ which was conceived after my million dollar net worth milestone was achieved in June 2014. Karl the Real Estate Agent was selected as a team member and will post net worth updates on a regular basis. Here is more about Karl. Family Income: $130,000 $150,000 (Personal full-time job); $15,600 (rental income before expenses); and, $50,000 $100,000 (spouse full time job). A lot of changes since my last update. Personal income is up substantially with this insane housing market (Yes I know the correction is coming). I sold my rental property recently when the mortgage renewed and took that money along with some savings and paid our house off completely!! We are super excited. Never thought I would get there on the timeline I set for myself. Goal #1 complete. Right after I had the opportunity to purchase a property to flip. With the market continuing to rise, the flip turned out a lot better than I had originally planned which netted my corporation a hefty profit. Furthermore, I have also taken on holding a second mortgage which pays 12% per annum for a one year term as well as setup and discharge costs. This investment is secured against the property. Now for something that will most likely fly like a bag of hammers around these parts. Since I was a child I have always been a car fanatic. Fanatic may be an understatement. Obsessed is a more accurate picture. I made the promise to myself that if I pushed to get the house paid off in the time I would reward myself with a car of my dreams. So I did it. I bought myself a low mileage German sports car with the intention of keeping it long term and catching some appreciation on it. Regardless, depreciation is unlikely as long as I don’t drive it all the time. My spouse and I currently live in our fourth personal residence since entering the real estate market in 2006. We used to move around town when I was able to find a decent deal to buy. That has all changed now with two kids (6&8), so now my real estate investing is done outside our principle residence. I currently own one rental semi-detached 3 bedroom in my personal name. While it would certainly feel good to pay off the mortgage, it hasn’t really been paid off if you refinanced to a HELOC and drew the whole thing down. You have 80% LTV on your house. Good idea to get rid of the rental, clears things up a bit. The second mortgage is certainly risky. If it’s only for a year, I wouldn’t renew it. Even if it’s secured by the property, you’re second in line (third if you count municipal taxes). Personally, I’m fine with the flip properties as long as you intend to sell them within 6-12 months. Right or wrong, realtors have access to ‘deals’ before they hit the market. Looking at your balance sheet and net worth, I’d say the Porsche was a poor decision at this time. Unless it’s some very unique model, it will depreciate, you need only look at second hand sites for the same model at 5yrs old, 10, 20. I, too, would like to have something like that, but there’s no way I would consider it until net worth was north of 1.5M with manageable debt and low debt to equity ratios. You should really focus on the RRSP and TFSAs. They are pitiful. At your age and income, they should be well north of 200K by now. I’m onto the TFSA topping up as we speak and hopefully the 200k mark will be reached soon. I’m very happy to be on this journey thanks to the frugaltrader and I’m working on being more on track. I knew that being part of this group would open me up to being criticized for some of my decisions, but like the majority of the population I’m human and am prone to getting off track along the way. If everyone was like a robot this entire forum wouldn’t exist. Karl, do you mean $20k for TFSA? Note that the maximum contribution up to 2016 is $46,500 each. Sorry to clarify. $200k total RRSP and TFSA. Currently have $80k of space for the TFSA so that is up first. I’m really nervous about all of your exposure to real estate. Investing heavily in one asset class is one thing. Doing that and selling that asset class for a living is just asking for trouble. Although, I will give you credit. The flip seems like a pretty good deal and you seem pretty aware of the risks associated with having all your eggs in one basket. I applaud your plans to diversify. I agree with Nobleea, you didn’t really pay off the mortgage of your primary residence. You just moved money around. I’d want to get to a much more secure place before splurging on a German sports car, but hey. To each his own. Overall I’d like to see you make a real effort to diversify. But nice work so far, you can’t really argue with your results. I don’t look everything as investment (you gotta car because it was your dream as you wrote). We all need that! I personally dont like flips but it is different for you being realtor. I am not in great position like your but i know, ‘Being satisfied’ means regress! hence keep going! Looks like you have a plan. Just catching up to your net worth updates, aside from all the real estates, do you have an investment target? I have found over time that while net worth is useful for banks to understand the assets they can go after, the principal residence is usually an expense rather than an income. To that end I focus on my investment portfolio goals over the net worth. Just curious if you have some of those targets. It looks like you don’t have a pension plan, not sure if your wife does. My target short term is to max out our TFSA which will put us at $100,000 in market investments. Hopefully by end of next year. At that point I am going to take a hard look at whether RRSPs are a good option for us or not. I get mixed advice on that as when I retire I do not believe that $100,000 a year will be enough to live off in retirement and I will for sure be losing half of that to taxes at that point. Anyone’s input on this is greatly appreciated. If you expect to be in a high tax bracket than then it does have an impact. You need to have a disciplined approach on your other investments and the type of taxes you will pay. If you say you will need more than $100K, chances are the RRSP account is not even big enough to fund it all anyways since there is a maximum contribution annually. Time to make use of the spreadsheet and establish tax patterns on investment vs income withdrawals. – that you re-invest the tax refund (either pay down debt, tfsa etc). An RRSP would likely be of benefit to you this year especially as you have a 55,000$ tax liability. Investing in an RRSP can eliminate that for now. Losing 55K to tax now is a huge permanent loss of capital. Figuring out tax brackets now vs. future vs. retirement would help your decision on when an RRSP is a good choice. @Karl – Amazing work bud!! You’re well on your way to financial freedom, keep it up! Nice to follow other’s successful journeys as I create my own. Assuming your income at $150K/year, max contributions of 18% ($27K, you’d get a refund of +/- 12K, which you can then invest directly into your TFSA). I’m doing this really basic here and not calculating the contributions you may have missed in previous years etc etc. Might I also suggest you take a look at CRA form T1213 to have that 12K deducted directly at source, aka more money every month as opposed to one larger sum at the end of the year. Next post: Wealth Building Tip – Take Advantage of Free Money! Previous post: Reader Mail: I have $1M+ Net Worth – What’s Next?